Companies, organizations or individuals tasked with installation of the latest GEPON, Active Ethernet and FTTx technology devices available from PBN including RFoG and HFC transport gear will find numerous features to help promote the ease of getting the optical communication system up-and-running. PBN engineers are located on four continents and are available on a 24/7 basis via ‘new’ on line global support portal that has been launched to help answer technical questions and assist with warranty and repair situations. PBN's dedicated Point-to-Point (P2P) optical networks allow operators to be prepared for the future. Our carrier-grade AOCM6000 platform combines full-redundancy with highest possible density in a unique solutions bundle. PBN FTTx products and services offer scalable solutions for startup providers as well as tier-1 operators. Operators are challenged with ever growing bandwidth demand and increasing price pressures. An optional CATV overlay allows FTTx operators as well as Cable MSOs to provide full-spectrum analogue and digital TV services on a single fiber to the customer. No matter if you deploy in a green-field or if you migrate an existing HFC/copper network to all-fiber, PBN provides solutions for voice, video and data services in your environment. 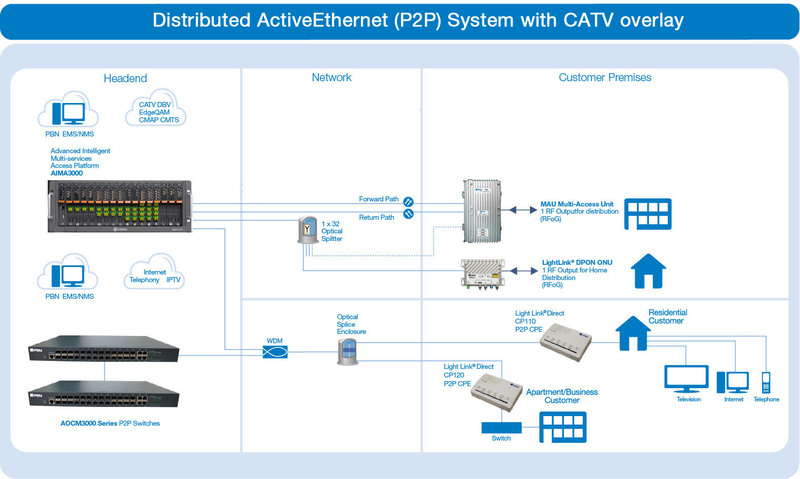 All solutions are offered with optional CATV overlay, a distinctive functionality of PBN. These systems feature pre-integration of PBN headend equipment, PON/P2P transmission equipment and the entire range of CPE’s. All aspects of the network are controlled by PBN's NMS3 provisioning and management software suite. Especially for operators with existing HFC infrastructure, CATV overlay is an attractive and cost-efficient way to offer a full-blown SDTV/HDTV spectrum to its fiber-connected customers. Fully prepared for IPTV, the AOCM6000 platform offers up to 1Gbit/sec. bandwidth to a single subscriber supporting up to 40 HD streams to a single subscriber in both, Multicast or Unicast transport. PBN's dedicated Point-to-Point (P2P) optical networks allow operators to be prepared for the future. Our carrier-grade AOCM6000 platform combines full-redundancy with highest possible density in a unique solutions bundle. PBN FTTx products and services offer scalable solutions for startup providers as well as tier-1 operators. Operators are challenged with ever growing bandwidth demand and increasing price pressures. PBN's AOCM2000 and AOCM3000 access and aggregation switches combine reliable low-cost subscriber access with high-performance aggregation into a unique solutions bundle. Our FTTx products and services offer scalable solutions for startup providers as well as tier-1 operators. PBN's dedicated Point-to-Point (P2P) optical networks featuring bandwidth up to 10Gbps allow operators to be prepared for the future. No matter if you deploy in a green-field or if you migrate an existing HFC/copper network to all-fiber, PBN provides solutions for voice, video and data services in your environment. All solutions are offered with optional CATV overlay, a distinctive functionality of PBN. These systems feature pre-integration of PBN headend equipment, PON/P2P transmission equipment and the entire range of CPE's. All aspects of the network are controlled by PBN's NMS3 provisioning and management software suite. Especially for operators with existing HFC infrastructure, CATV overlay is an attractive and cost-efficient way to offer a full-blown SDTV/HDTV spectrum to its fiber-connected customers. Distribution of IPTV streams in decentralized deployments tends to be a management and performance challenge. PBN's AOCM2000 and AOCM3000 access and aggregation switches combine reliable low-cost subscriber access with high-performance aggregation into a unique solutions bundle. Fully prepared for IPTV, the AOCM2000 and AOCM3000 platforms offer up to 1Gbit/sec. bandwidth to a single subscriber supporting up to 40 HD streams to a single subscriber in both, Multicast or Unicast transport.